While investigating about competing online photo sharing and photo album services to snapmania (our company‘s online photo editing and sharing application), I discovered a nice way to upload pictures on Yahoo Photos. Using Mozilla Firefox, you can install a plug-in which allows you to drag picture files directly from the Finder to the website to add them to your online album. I guess there is a similar plug-in for Internet Explorer on Windows, but I had no PC around for testing this. Have you tried flickrs upload tools? I know, but these are regular desktop applications. 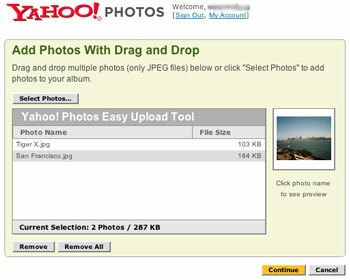 But Yahoo photos uses a browser plug-in! Recently I had a look at Phanfare (.com) and their Automatic background photo uploading looks very good and will be appreciated by a lot of customers. How about Menalto Gallery. Just host your own Photogallery. It includes a Java Upload Applet (Drag and Drop), Gallery Remote (Also Drag and Drop), Windows XP Publishing agent, HTML Upload, Picassa support, FTP Upload etc. To add it to WordPress install the WPG2 Plugin and you are all set. To Upload single Pictures in WordPress (with Pop-Up functionality) use the Image Manager Plugin for WordPress. Try this link I use this program on a few of my websites and it works great. You do need to know some basic programming. This is a Java applet that allows you or other users to drag and drop folder (or subfolders) and then it will resize the photgraphs and place them in the directory of your choice. It is very customizable.